Thanksgiving in my family always mean to go big or don’t bother trying to cook. I mean, it’s the holidays so there’s no need to heed to our waistlines and calories and just enjoy the food. My brother wanted a roasted turkey so I remembered reading from Thomas Keller’s mayonnaise turkey several years ago and thought this might be a good time to experiment this idea. I dry-brine the turkey first and made my own mayonnaise. It’s made with egg yolks, Dijon mustard, garlic, paprika, salt and pepper. 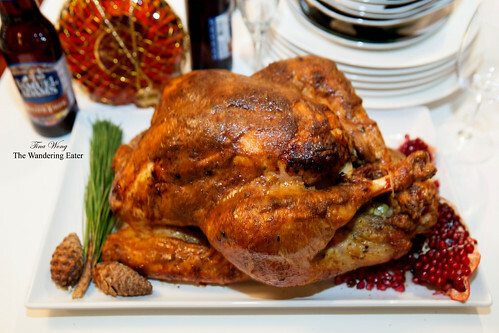 The bird yielded to even browning and it’s infused with a ton of flavor and still juicy. There are more meats on the table since the men in my family loves their animal protein so we grilled up some beautifully marbled and aged Pat LaFrieda tomahawk ribeye steaks and my mother made one of her famous stews, this one was dongpo pork (东坡肉), a luscious, melt-in-your-mouth, braised pork belly, which I will divulge her recipe toward the end of this post. 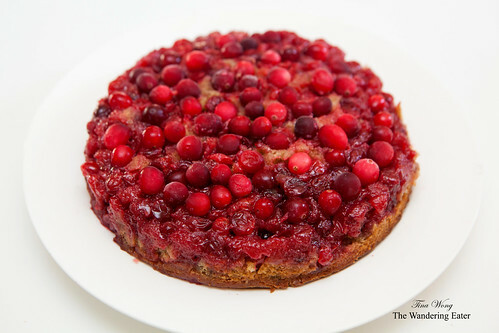 Of course, there’s dessert and had the wonderfully tart, upside down cranberry cake. The recipe was from Dorie Greenspan’s “Baking: From My Home to Yours.” The simple yet delicious cake was a good foil to the decadent meal. 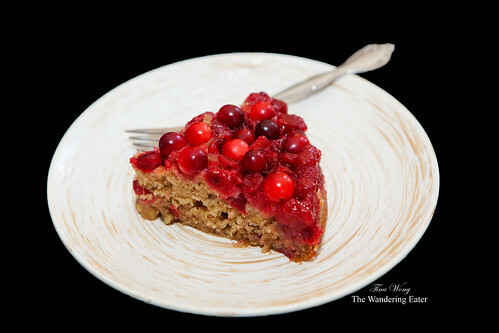 I mixed the cooked and fresh cranberries to have the various textures and range of tartness of the cranberries. 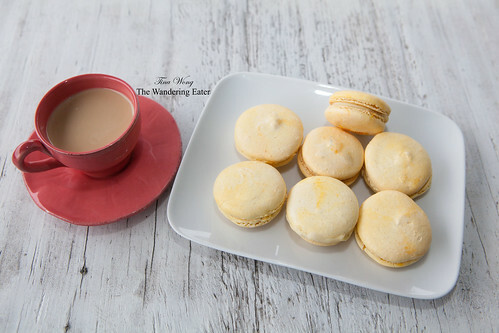 And I made a batch of jasmine tea-wasabi macarons based on Pierre Hermé’s book “Macarons” recipe. These were petit fours so to speak to end our meal on a sweet, gently floral note. We had other side dishes of vegetables (like roasted sweet potatoes and shaved brussels sprouts salad) and a homemade orange-cranberry sauce. 1. Slice the pork belly into fourths, so you would still yield large chunks by the time you’re serving. 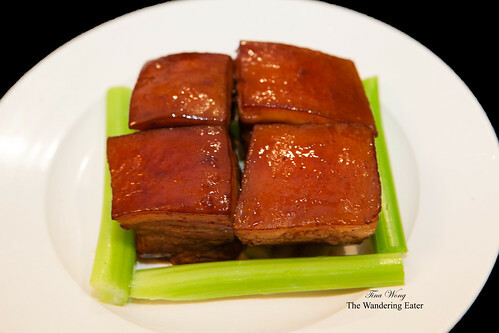 Heat up a large pot in medium-high heat and place your pork belly in just to render off its fat a bit. You don’t need to brown the meat but do flip it around to evenly cook the each side about 2-3 minutes. Once all sides are cooked, remove them to a clean plate and set aside. Discard the rendered fat. 2. Add all of the ingredients into the large pot and let it come to a boil. Once it starts to boil, lower it down to a simmer and let it braise for about 2 hours so the pork is cooked through and the meat is easily pierced through with a knife. Serve immediately. 2. Stir with your hands (or food processor) the flour, baking powder, sugar, baking soda, salt, and black pepper in a large bowl. Add the butter and mix it until it’s melded into the flour (up to the point the butter looks like coarse meal or peas). Mix in the remaining ingredients until it just incorporated. 3. Take a large ice cream scoop (about 2-inch diameter) and place each scoop on to a parchment or silcone mat lined sheet pan with 1/2-inch space between each biscuit. Bake for 15 minutes or until golden brown. 4. 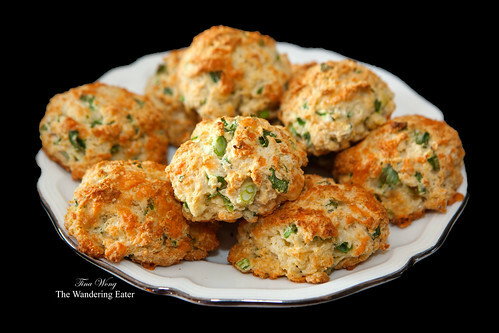 Remove the biscuits to a cooling rack to cool for 2-3 minutes and serve. 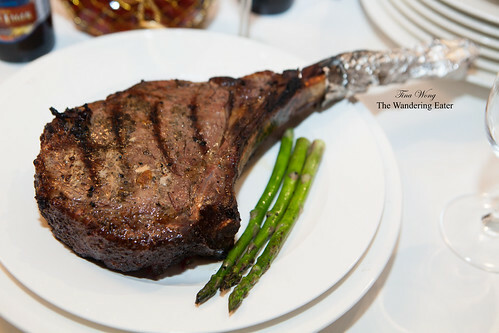 It’s best eaten quite hot but it can keep in room temperature for up to 2 days.